The 4th PAPGI session was held on 4th – 5th October 2012 at Grand Centara Hotel, Bangkok as part of the INCOB 2012. This was made possible by SC representative from Thailand Dr. Sissades Tongsima and his team. There were 7 presentations by members on the 4th in a session chaired by ME Phipps, followed by 2 presentations and a general discussion on 5th chaired by PS Lai. The aim was to follow up on the project timelines, issues and updates from the 3rd meeting at MUSC in July. It was agreed that PAPGI will continue with our official affiliation with HUGO and that formal endorsement and statement of support will be sought from current HUGO President Dr. Edison Liu. A write-up document about PAPGI for the purpose of IRB application will be drawn up. This will be emailed to all members and will be useful for IRB and research fund applications. We will also formalize our affiliation with the Asia Pacific Society of Human Genetics. - Age depends on specific community preference and PI’s opportunity. Only adult to be sampled. 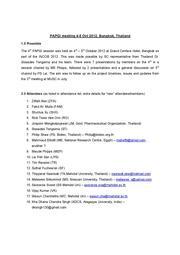 - SF, ST and Thai researchers will discuss the Thai ethnic groups to be included and confirm with PAPGI by 15th Dec 2012. - Saitou Naruya (Natl Inst. Of Genetics, Japan) a population geneticist and collaborator of Tokunaga, Phipps and Jinam, wrote officially to S Sugano (SC representative form Japan) expressing interest to join. SS has accepted and PAPGI welcomes Dr. Saitou into the consortium. - FAM suggested that PAPGI collaborate with Human Variome Society (HVS) due to some shared interests, members and potential benefits. Also HVS is supported by WHO and UNESCO. TR already introduced Prof. Al Jumah to the PAPGI structure, objectives and philosophy but an official letter of invitation from the Chairs of the steering committee is NECESSARY to move forward with the Saudi samples. TR, ST, SHX and members of the Bioinf Working Group will be discussing in consultation with Jong Bhak in detail. The BioIT pipeline strategy and implementation will be confirmed by the nx PAPGI meeting planned during the 10th Asia Pacific Congress of Genetics, KL on 4-6th Dec 2012. The ELSI section of CP has already been drafted by LPS and will be further detailed by members in ELSI working group such as EMC, MEP, CP, etc. The overview will be drafted by YY Teo, BP Hoh and other members who had volunteered. (a) After Bandwidth testing, the decision is to send hard drives between ‘host’ IT labs with high IT platforms and computing facilities to ‘guest labs’ because the internet would take too long. Of late, various members have received emails form external parties requesting information or interviews about community engagement and ELSI issues for PANSP and PAPGI. Due to the fact that it would be very difficult to ascertain the motives for these interviews or how the information will be eventually used, members agreed that a cautious approach would be taken to prevent any negative or unfavourable consequences. This has happened in the past with other large scale genome projects where some researchers were quoted out of context, which lead to aspects of the project being jeopardized. It was agreed that PAPGI members engage with external parties who had any queries about the issues mentioned only in their own capacity and on their own personal research. Any request for PAPGIPANSP or PAPGI information would require formal application to Steering Committee thru’ the CoChairs and will be discussed before any decision is taken. Mr. Halabi, a Saudi Ph.D. student of PAPGI member Mahmood Ameen has suggested that PAPGI apply for research funds to the Prince Al Waleed bin Talal Foundation. The Princess, consort of the prince, administers some philanthropic fund from the foundation which may be open to international projects which involve Saudi Arabia. TR will liase with Halabi and contact the foundation. He will update PAPGI when he has the full information before December. FAM suggested the ‘Kuwait Foundation for the Advancement of Sciences’ for PAPGI support. He will also be making enquiries and inform the SC. PAPGI's Co-Chairs should contact KFAS officially requesting support through a project and International collaboration. HGM /ICG 13-18 April 2013 in Singapore. Teo Yik Ying will be requested to host a SC teleconference in November 2012 for additional updates. Members were encouraged to host PAPGI meetings if they are organizing any future genetics/genomics meeting in their countries and to provide the necessary support for members to attend. The meeting ended at 4.30pm with a vote of thanks to the local organizers & hosts, and all members who participated and VK who took notes. This page was last modified on 18 October 2012, at 04:54.